Murals are often rather fun puzzles so do have a go identifying what you can before reading further. A key given at Ponyhide helped us with a number of references. 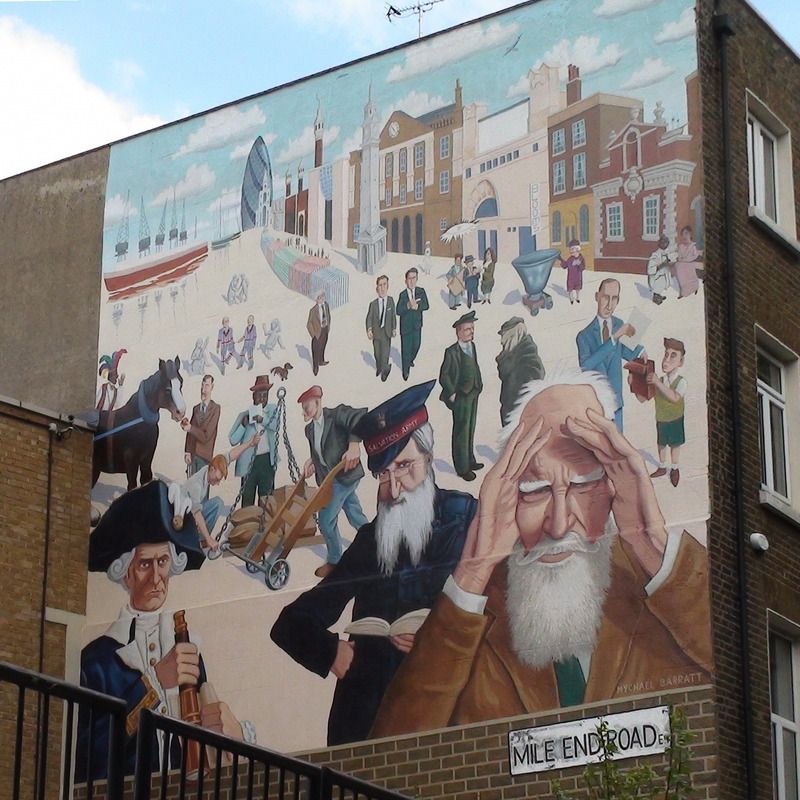 As well as the ‘Subjects commemorated’ that we list on this page, this mural also shows: dockers (loosely based on the statue Dockers at Victoria Dock), some Eric Gill sculptures (he did the reliefs on the People's Palace), the artists' dog 'Scout'. WW2 is referenced by the V1 flying bomb in the sky. A section of ‘Guernica’ is depicted, a painting by Pablo Picasso displayed at Whitechapel Art Gallery in 1939. And the buildings: 30 St Mary Axe, Christ Church Spitalfields; ‘House’ - artwork by Rachel Whiteread - cast of the inside of a house on Grove Road; East London Mosque; Baron de Stern clock tower; Royal London Hospital; Whitechapel Art Gallery; Blooms - kosher restaurant; Trinity Green Almshouses. Let us know if we've missed anything. The inclusion of some of the characters needs explanation: Gandhi stayed at Kingsley Hall in 1931 when he came to London to discuss Indian independence. The Queen visited Whitechapel Bell Foundry in 2009. Hockney had his first exhibition at The Whitechapel Art Gallery in 1970. George Bernard Shaw attended Fabian Society meetings in Whitechapel. Pepys's mother was the daughter of a Whitechapel butcher, and his diary records him visiting the area. Lenin lived in nearby Fieldgate Street. Charrington is shown symbolically taking a brewery dray horse out of service. This mural was covered in a Londonist post and the comments focussed on how few women are represented. True. Designed by Mychael Barratt who also painted it, with James Glover and Nicholas Middleton. More about Baratt and his work at Spitalfields Life. The two plaques are inside the gates, one on each side, on the set back walls facing the pavement. The statue is William Booth and not yet published.